From 1996 through 1999 Daniel Rosenblum conducted ten hours of interviews with his father Louis Rosenblum on the subject of his involvement in the Soviet Jewry movement. The interviews were recorded on cassette tape, then transcribed to digital text files. The transcripts were then edited and fact checked by Louis Rosenblum and the attached Adobe Reader (pdf) file created. We are pleased to web-publish the interviews. Read Daniel Rosenblum's interviews of Louis Rosenblum. 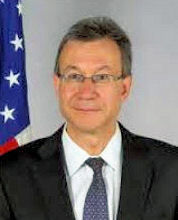 Daniel N. Rosenblum is Deputy Assistant Secretary for Central Asia at the U.S. Department of State. He has served our Department of State since 1997. Before coming to the State Department he spent six years at the Free Trade Union Institute of the AFL-CIO and was a legislative assistant to Senator Carl Levin. He holds a BA in History from Yale University and an MA in Soviet Studies and International Economics from the Johns Hopkins School of Advanced International Studies.